In typical Victorian fashion, the longer the title of the Railway Company, the shorter the route mileage. The Grand Crimean Central Railway was constructed by Messrs Peto & Brassey to link the port at Balaklava with the British camp on the uplands. It used inclined plains to reach the hieghts, and locomotives thereafter. Brian Cooke in 1990 wrote a very short and patchy history of the railway. He states that it had six locomotives, all of which were second-hand to "old LNWR designs" and that they were tender engines, to a design of Bowen-Cooke, probably 2-2-2s. It is blatently obvious he has not read the very well researched paper in The Journal of Transport HIstory, vol 1 (May 1953), pp. 28-43, which provides a complete chronology and detailed history of the railway. 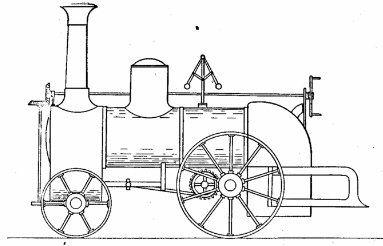 John Goodchild, Wakefield historian, suggests that two tank locomotives, built in Leeds, for a colliery railway in Wakefield (running from what is now the National Mining Museum) to the mainline were seconded by the Government for use in the Crimea, the colliery railway then having to rely on horses. Robbins in his paper on the railway suggests that the first two locomotives were second-hand from a colliery railway belonging to Sir John Lister Kaye (thus confirmed by Goodchild) which were overhauled at the Railway Foundry in Leeds before being sent to the front. Records from E B Wilson-Hudswell, Clarke & Co., of Leeds suggest that they supplied two 2-4-0 tank eninges for the Crimea, in 1855. They had 5' 6" diameter driving wheels and a domeless boiler to the design of John Gooch. The first locomotive, christend "The Alliance" was shipped in September 1855 according to the Leeds Mercury of 8 September 1855. The Leeds Intelligencier states that "The Alliance" was shipped from the Railway Foundry via Southampton to the Crimea in its edition of 8 September 1855. She was "a small locomotive"..."what is a called a tank locomotive so that it carries all the water and fuel it requires on the body of the engine". The Leeds Mercury of the same date, however, suggests that the first engines sent out came from the Waterloo Colliery, Leeds, and were rather too small for the heavy gradients. They were 2-4-0s (presumably those two sent out earlier in the year)and instead the Railway Foundy, Leeds, supplied two much larger 0-6-0 tank engines. This would make sense as an 0-6-0 has all its weight available for traction, compard to a 2-4-0. However, the 2-4-0 would be better at taking sharp curves, but an 0-6-0 tank engine would be able to run equally well in either direction and not require turning. The Mercury also hints that the locomotives might have been armoured having iron plates to protect the crew. Indeed, the crew were armed with revolvers. The Editorial of the Mercury suggests that the line was being re-laid as it was worn out, but, more importantly had to be relaid with stronger rail due to the weight of the new locomotives on order. W H Russell in The Times names two locomotives, the "Alliance" and the "Victory". He also confirms that a third locomotive was called "Swan". The Proceedings of the Institue of Civil Engineers (vol. 152) for 1903 confirms that the locomotives came from E B Wilson-Hudswell, Clarke & Co. of Leeds. It is also clear that the Government put the contract for the locomotives out to tender as "Mr Peacock of Manchester" (presumably Richard Peacock, founding partner of Beyer, Peacock & Co.) submitted a tender for locomotivesfor the Crimea in 1855. In otherwords, the frist two engines sent out to the Crimea were second-hand 2-4-0s, originally intended for the colliery railway of Sir John Lister Kaye. They were overhauled in Leeds before being sent to the Crimea via Southampton. A further two, larger, 0-6-0 locomotives followed, also from Leeds as the original two locomotives had proved too small. "Alliance", and possibly her sister "Victory" were therefore 0-6-0 tank locomotives. Also controversial is matters of gauge. Goodchild indicates that the gauge was 4 feet 8 1/2 inches (standard) as the colliery line in Wakefield had a main line connecton; The Railway Gazette (vol 107) suggests a gauge of five feet six inches because the first two locomotives were purchased second-hand and had originally been intended for the Indian Railways which use that gauge. Robbins suggests that the gauge may have been 5 feet 6 inches as two engines, one of which was called the "Balaklava", the other "Fortuna" [sic, Portena?] 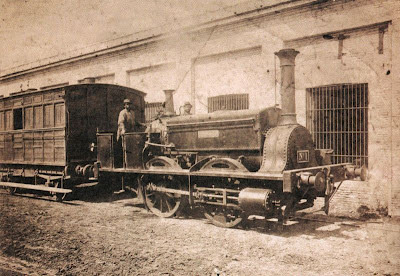 were shipped to Beunos Aires, the first steam engines to run in Argentina. They were still running in 1883 between Buenos Aires and Tigre. The only problem with this is, is that "La Portena" is not a 2-4-0 but an 0-4-0 saddle tank.She was preserved on the orders General Peron in the 1950s. I suppose its possible she was converted from a 2-4-0 to 0-4-0. She does look rather truncated at the front; Today she is preserveds as a 2-2-0, obviously at some point having lost her coupling rods! Another problem is that "La Portena" has wheels of 4-feet (48 inches) diameter, not the 5 feet 6 inches recorded in the E B Wilson-Hudswell, Clarke & Co order book: however, the refernce to 5 feet 6 inches for the wheels may relate to the gauge. The Morning Chronicle (26 April 1856) says that the several railway companies had submitted tenders to purchase either part or the entire Crimean railway: the Heraclean Colliery Ltd offered to buy the entire ralway and infrastructure and indeed The Standard carries an advertisement selling the railway in lots.This, therefore, would support the claim that locomotives, rolling stock and track found their way to Argentina. The Times in 1927 states that "La Portena" arrived in Buenos Aires along with rolling stock and track from the Crimea; the five passenger carriages were described as looking like "London Omnibus carriages". The Times of 12 November 1940 notes that two of the engines sent out to the Crimea were still in existance, in Buenos Aires. They were purchased second-hand by Peto and Brassey for building the Buenos Aires Great Southern Railway in 1857. According to The Times those two engines had a gauge of 5 feet 7 inches and were also rumoured to be originally intended for India, but a gauge of 5 feet 6 inches is far more likely. E B Wilson-Hudswell, Clarke & Co later supplied locomotoves for Buenos Aires, to a guage of 5 feet 6 inches, which was the same as used in India. Perhaps it is the similarity of the guages that led observers to think the first engines sent to th Crimea were re-directed from India. This, however contradicts the Times of 1940 which suggests the locomotives for Buenos Aires came from Lancashire! That locmotives from the Crimea went to Buenos Aires is confirmed by a paper in The Locomotive (15 June 1909) which suggests that the first steam locomotive to run in Argentina was one of the Crimean engines. The Railway, Wagon and Carriage Review (vol 14), 1908 confirms "La Portena" and her sister were supplied by E B Wilson-Hudswell, Calrke & Co. having been used in the Crimea. The Railway Gazette for 1907 suggests "La Portena" and her sister "La Argentina" being the first locomotives in Argentina defined the gauge of railways in that country: the track was layed to suit the gauge of the engines (5 feet 6 inches). Cooke suggests it is not known how the track bed was formed; despite him citing documents in the National Archive which say it was a "baulk road" in otherwords with longtitudinal sleepers and cross-bracing a la Brunel. Cooke, however, bases his interpretion of how the track was laid on Fenton's photographs and illustrations from The Illustrated London News., the latter showing the traditional sleeper arrangement. Sir Francis B Head, writing to The Times states catagorically the track was laid on a foundation called a "plank road" whereby planks were laid on a raft of timber or brush wood longitudinally and then transverse planks were laid on top. A method reputedly used by Peto & Brassey for crossing boggy groun in Canada. So to sum up, a quick trawl of my literature and of the Leeds Newspapers contradicts Brian Cooke's book The Grand Crimean Central Railway: The Railway which won a war. Whilst Cooke has used the archival material in the National Archives he has not read contemporary newspaper accounts, technical journals nor consulted the archives of the major railway locomotive constructors. Therefore, there is scope for a new book, or at least a paper, identifying the locomotives used in the Crimea.